Student Volunteer Kourtney Thompson, center, assists Sharon Okune with her groceries at the Temple University food pantry, in Philadelphia, Thursday, August 09, 2018. On a Thursday in late July, Claire Vilain wandered through Temple University's Cherry Pantry for the first time. She chose peanut butter, grape jelly, kettle chips and oatmeal – foods that would last. The 24-year-old graduate student has a summer meal plan that covers lunch. For nearly everything else, she must fend for herself and find other low-cost or free ways to eat. For Vilain, that makes the pantry "pretty dope." At Temple, as across the region and the country, food pantries are popping up to help students when financial aid and other campus resources fall short. And at some colleges they've become a summer lifeline for students. 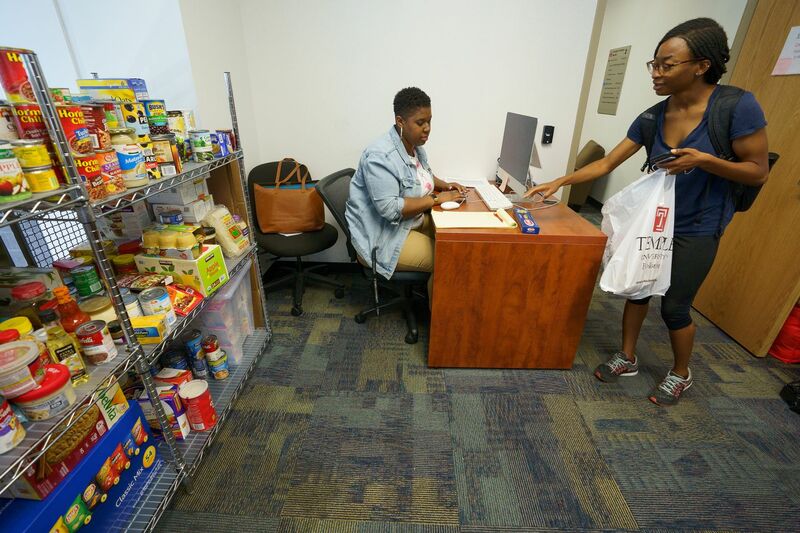 Each week this summer at Temple's nearly eight-month-old pantry, the same handful of students showed up for the free nonperishables during the pantry's limited hours, according to the pantry's lone summer volunteer, Kourtney Thompson. Graduate student Sharon Okune selects groceries at the Temple University food pantry. Many, like Vilain, were dependent on the pantry for meals. Finding food in the summer is "definitely harder," Vilain said. "The food around here is kind of expensive, so it's like trying to find that good alternative between what I can afford and what's healthy, because I'm not trying to just put anything into my body," she said. At colleges around the nation, research shows thousands of students are what's known as "food insecure," meaning they have limited access to consistent, adequate, nutritious meals. One 2018 study of more than 20,000 students at 35 four-year colleges and universities found that 36 percent of students were food-insecure. The issue has been shown to be even more prevalent among students of color. In a 2016 study, 57 percent of black students reported food insecurity, compared with 40 percent of non-Hispanic white students. In its own survey last fall, Temple found similar results, with more than one in three students meeting the criteria. That's one reason the donation-based Cherry Pantry remained open this summer. During the fall and spring semesters, when campus life is in full swing, it can be easier to finesse and find meals by going to free food events or signing up for night classes where teachers bring food, said Sara Goldrick-Rab, who has researched food insecurity on college campuses for 10 years. Temple University professor Sara Goldrick-Rab. In the summer, those options dwindle, she said. Goldrick-Rab is a sociology and higher education policy professor at Temple University and founded the Wisconsin HOPE Lab, which authored the study that revealed food insecurity on Temple's campus. Other schools have taken similar steps. West Chester University's resource pantry was open on a limited summer schedule and drew a constant flow of students. More than 130 students shopped — 56 of them new — and over 2,000 pounds of food were distributed at the resource pantry this summer, according to Kate Colyer, assistant director of service-learning and volunteer programs. At Temple, students are allowed one visit to the Cherry Pantry per week and are given a limit of 16 points to get a variety of free nonperishables, from pineapple chunks and canned spinach, to steel-cut oats and pasta. Each pantry item is worth either one, two, or three points. The pantry is run completely by food and financial donations, said its director, Michelle Martin. Bulk donations of canned goods still come in frequently, Martin said. "Temple's community support has been really amazing," she said. The increase in pantries comes as the cost of a college education has skyrocketed, sparking a national debate. Rising student debt – collectively, students owe $1.5 trillion in student loans – coupled with upticks in tuition and cost of living means many students struggle to get by. In interviews, students who patronize the pantry described their finances as complex balancing acts, where they must budget hard and often choose between basic necessities, such as paying rent, eating, or washing clothes. "I know a lot of people whose money is tight, so they work in a restaurant and try to eat as many meals at work as possible for free," said Gretta Rauhoff, a 21-year-old psychology major who also has a waitressing job. One day late last month, she and Lucy Crawford navigated through unpacked donation boxes in the pantry and shelves filled with canned food. The duo chose a variety of food: canned beans, mac and cheese, an assortment of protein bars. In the week before, Rauhoff said, she ate leftover scones from her restaurant job every day for each meal – because they were free. "I felt so terrible because scones are terrible for your body," she said, "but I was like, 'This is so many free meals.' "
Shortly before Vilain arrived, another woman, a rising sophomore, was also feeling the financial stress. She noted that during the summer, Temple's dining halls are open only for limited lunch hours — and other eating options are too expensive. "Every cent I make goes to rent," said the woman, who asked not to be identified as a student who is food-insecure. The hunger such students face is often written off as part of "the college struggle," said Samantha Retamar, who works with local hunger organization Philabundance, "like, this is the price you pay for wanting an education." "But it doesn't have to be," she said. Sam Retamar, Communications Coordinator for Philabundance, experienced food insecurity while she was in college. While Retamar was at college in Florida from 2011 to 2015, she said, she was food-insecure despite receiving financial aid, working a part-time job, and receiving some Supplemental Nutrition Assistance Program, or SNAP, benefits. "Because so many of us were dealing with it, I didn't think it was a problem," Retamar said. One summer, things got so bad that she and her friend came up with a plan to ease their hunger, at least for a while. They would order a $5 box pizza, cut the eight slices into 16, and share it as meals until it was gone. Then they'd do it over again. She's sure the same struggle occurs today. "I am concerned that this is the least well-cared-for generation of college students that we've had," Goldrick-Rab said. "They have been hung out to dry by rising prices, and really are in tough shape." Philadelphia Media Network is one of 19 news organizations producing Broke in Philly, a collaborative reporting project on solutions to poverty and the city's push toward economic justice. Follow us at @BrokeInPhilly.